To achieve the Maritime Mile, stories and photographs of Minehead’s maritime history and colourful heritage would be presented, including the Raj exercising his polo ponies on the beach, outdoor swimming competitions, packed beaches from yesteryear, Edwardian architecture and iconic images of the past, combined with interactive features and eye-catching displays. Fitzpatrick Woolmer (FWDP) developed innovative interpretation displays, designed to capture the visitors’ imagination, transporting them to bygone days and illustrating how the resort has evolved over time. 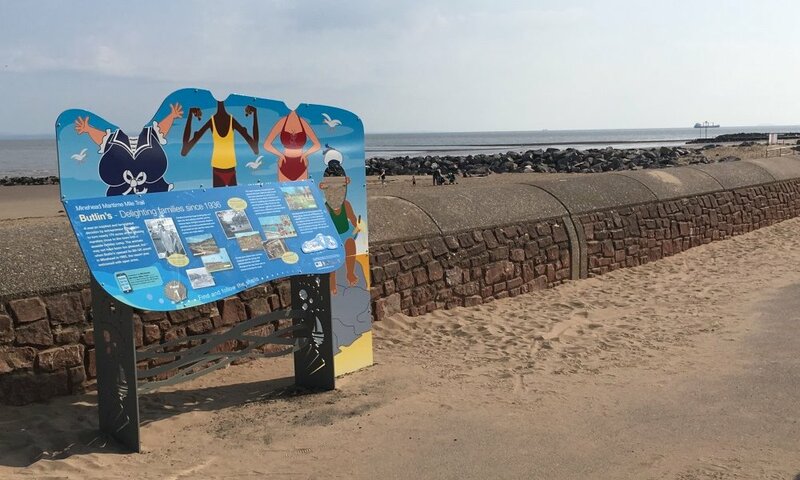 Bright colours and iconic seaside images were combined to create playful interpretive features, designed to appeal to all ages and lead visitors on a journey of discovery. 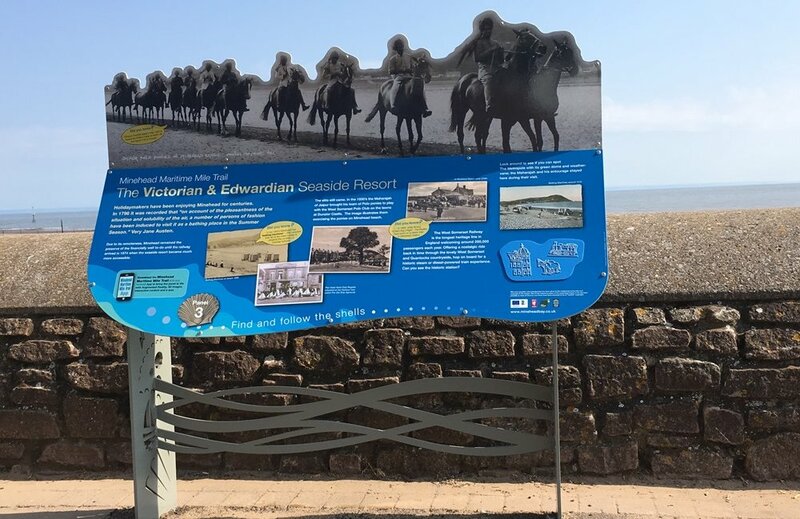 Traditional and digital interactive features included tactile rubbing plaques produced from etched zinc and an Augmented Reality based web App, creating a fun and informative activity trail. 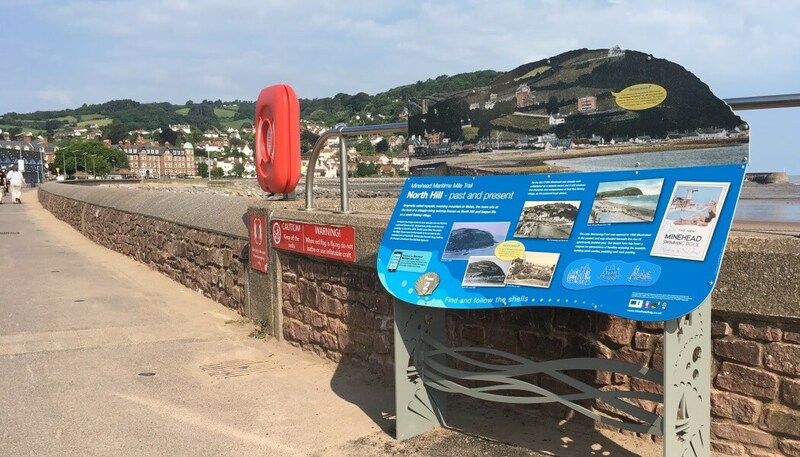 Life size photo displays present a fantastic opportunity for physical engagement and sharing experiences on Social Media, helping to raise the profile of Minehead’s seafront. Themed displays were manufactured from stainless steel to withstand the harsh coastal environment, with lasercut details of classic seaside images. Graphics were produced as full colour n-viro™ prints, a highly durable printed graphic panel offering a 10 year lightfastness guarantee and the easy removal of graffiti. FWDP provided a full service of display concept design, graphic design, planning application approval, manufacture and installation, supplying a total of 5 lectern format and wall mounting interpretation displays. FWDP is a creative design company passionate about enhancing the visitor experience. It specialises in exhibition design, heritage interpretation, App design, interpretation planning and visitor guides and leaflets. For more information visit our website here.